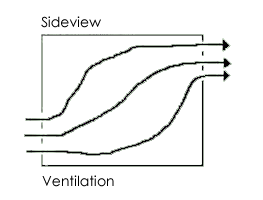 Ventilation To avoid stagnant moisture as well as still air a terrarium should have two opposite ventilation areas. (One should be on a lower and the other one on a higher position.) The most available terrariums (like for spiders) have just one ventilation area. These ones are not recommendable. In the majority of cases this terrarium types cause stagnant moisture and/or still air and as a consequence often the death of the mantid. Sometimes such terrariums can be useful for mantids which have to be kept at a high moisture (like Hymenopus coronatus). Humidity The relative humidity (rh) is one of the most important parameters for a succesful keeping and breeding of mantids. It adds to the unproblematic molting and the well-being of the mantids. But every species has its own requirement to the humidity, depending on their origin between low (desert/semi-desert) and high (rainforest) humidity. Thus the orgin or the habitat should be known. If it is not possible to define the origin or the habitat you have to test it. Therfore small groups have to be split up (if possible). The first group should be kept at low rh (30 - 50%), the second at a medium rh (50 - 70%) and the third at a high rh (70 - 100%). Temperature Mantids choose the optimal temperature on their own, if they can. For that it is important to create a temperature gradient within the terrarium. A heater can spot a maximum temperature (especially for mantids from desert regions). In smaller terrariums it is not possible to create a temperature gradient, so you have to choose a medium temperature, between minimum and maximum (male nymphs often need a lower temperature than female nymphs, s. "Growth and Lifespan"). Also the behavior can show the well-being of the mantid. If it sits at the ventilation area it could be too hot inside. High temperatures are worse than lower. A sudden temperature change has to be avoided. It is better to low/ increase the temperature slowly (also the ligthing period). Thus a shock can be prevented. During the diapause ooths can be put in the refrigerator.